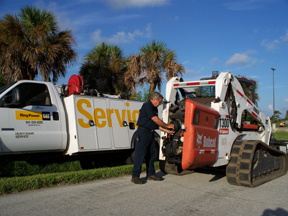 Bobcat owners in Sarasota and Jacksonville turn to Ring Power for superior service. Following the recent closures of Bobcat® dealerships in Jacksonville and Sarasota, Bobcat owners in these territories have become increasingly concerned about where to find the parts and service they will need to keep their skid steers and compact track loaders up and running. We’re here to tell them they can stop worrying! In this market, nobody can afford downtime. But Bobcat owners are finding out that they can rely on Ring Power. We are open for business and we are here to stay. In addition to skid steer loaders, multi-terrain loaders and compact track loaders,Ring Power services manlifts, aerial lifts, mini hydraulic excavators, wheel loaders, compactors, boom trucks, dump trucks, utility trucks, backhoe loaders and dozers made by Caterpillar, Bobcat, Genie, Terex, JCB, Lull, and other leading manufacturers. Call or email us to schedule service for your Bobcat or other compact construction machines.